Bangladesh Army Job Circular 2018. Big opportunity is coming for doing your nation by joining Bangladesh Army Commissioner Officer. Selection exam will be taken at next year, selected candidates will train at Bangladesh Military Academy for two years which is known as BMA long course and joined as second lieutenant in Bangladesh Army directly. Bangladesh Army Commissioned Officer Job Circular 2018. 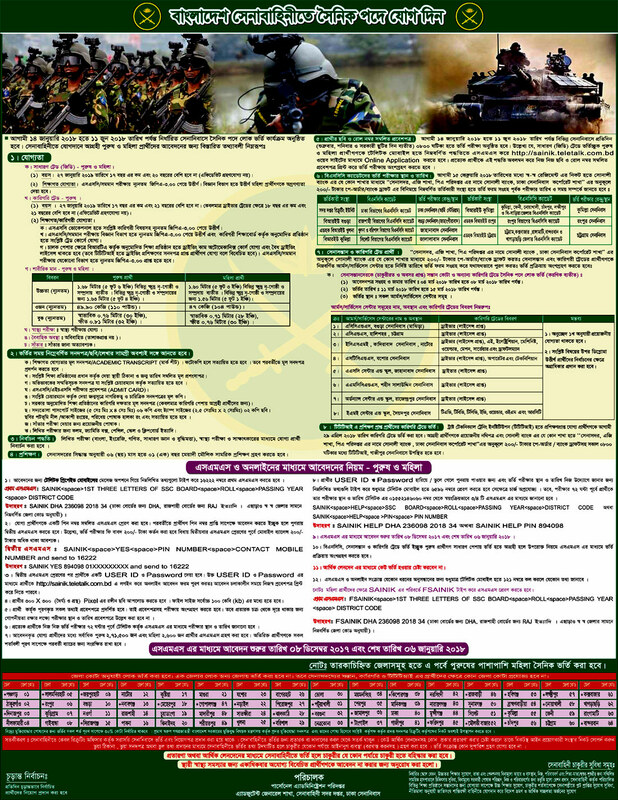 For getting details information about join Bangladesh Army Commissioned Officer 2018, you have to visit at www.joinbangladesharmy.mil.bd. Candidates must be Bangladeshi citizen. Candidate must be upper education Qualification to join in Bangladesh Army as a Commissioner Officer. Nationality: Candidates must be Bangladeshi citizen. Exam details:Candidate will be start application to join Bangladesh Army from 27 November 2018. For application candidate must go to this www.joinbangladesharmy.mil.bd website and apply directly. With necessary information applicant will apply in Bangladesh Army till 08 and 20 january2018.Candidates must be less than 24 year. Applicant will submit their application by Online Application form. Application fee is tk. 1000/- only. Applicant submit application fee only by Trust Bank Mobile Money. Those candidates were dismissed from any government office they already disqualify. Those were walking out from ISSB exam for two times they are disqualified. One time walking person will able to apply. Those are disable by Medical Board are also disqualify. We will publish more news and information about Join Bangladesh Army Commissioned Officer 2018, it’s related. So, visit our website to get more defense news.